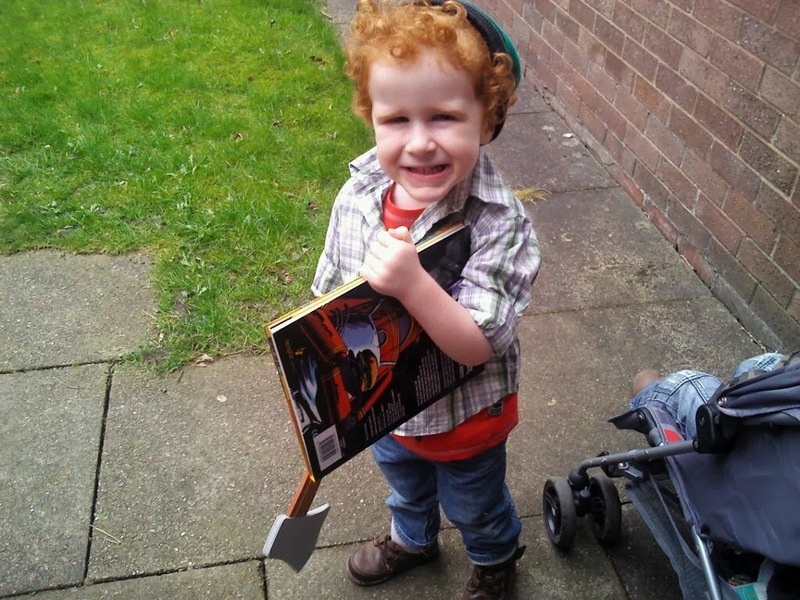 The Brick Castle: What did your kids wear for World Book/DVD Day? 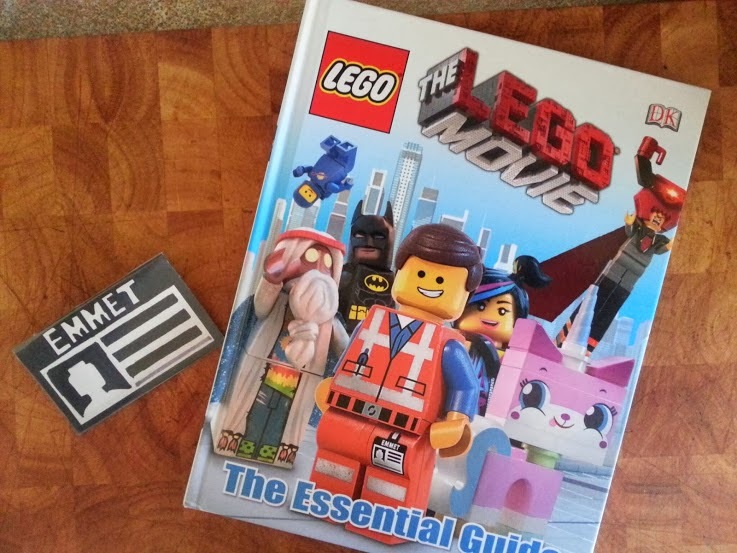 Or how to make a LEGO Movie Emmet's Piece Of Resistance! Back when children where I lived started dressing up for World Book Day my daughter was the only one really the right age, and she had Disney Princess dresses - which are generally all based on fairy tales - we had a choice of Cinderella or Sleeping Beauty, so that was cool. Boys just don't dress up the same as girls do - they tend to either BE Spiderman or Bob The Builder for about 3 years, or not be interested at all, mine have been the latter, so when it came to World Book Day 2 years ago I was really pleased with myself for using a foam axe from Halloween and a shirt and wooly hat and voila, The Woodcutter. 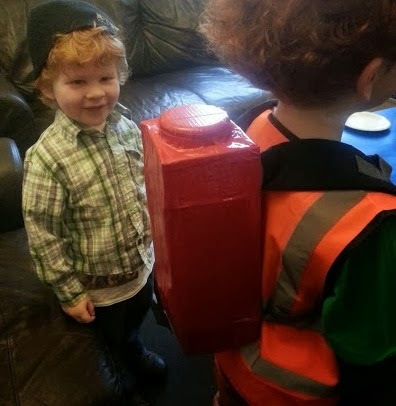 Last year I think school wasn't open on World Book Day, so it passed us by, this year I had two children to dress up. I have always had a bit of an issue with children turning up for World Book Day dressed as Buzz Lightyear. It's a film, it's not a book. Captain America and even Spiderman are comic book characters, so they're passable - although a bit naughty if the children haven't seen the comics. I discussed this with my boys and said they had to pick a character from a book. 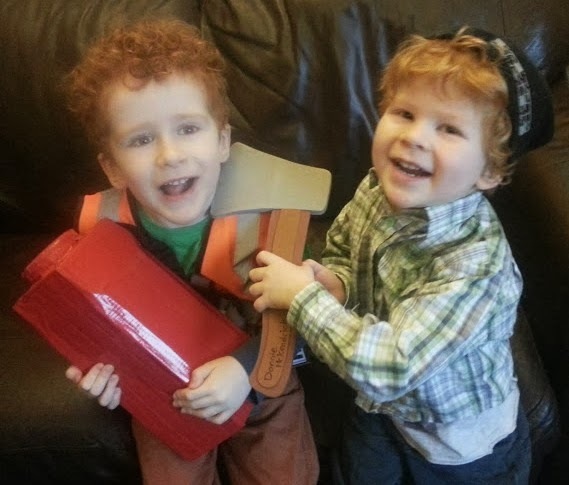 My youngest wanted to wear the Woodcutter outfit like his big brother, he's seen the photo, that was all good, but my 5 year old... "Emmet from the LEGO Movie". I can't really argue with him, he's read that book to himself in bed every night for the past week, he's proud he can work out some of the words and follow what's happening and it's definitely encouraging him to read, which has to be the point really. 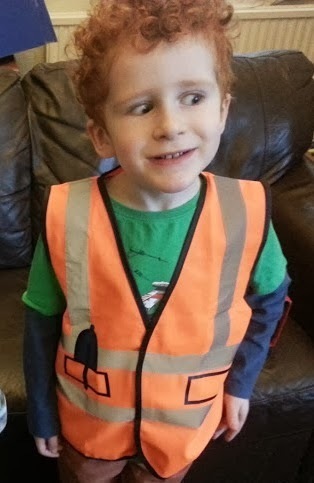 Dad spent several hours transforming a roll of red Duck Tape, a tin of sweets, a cardboard box and a children's rucksack into a Piece Of Resistance, our oldest girl made a fabulous Emmet badge, and a nice lady from ebay printed us a genuine orange flourescent jacket for a bargain £3! 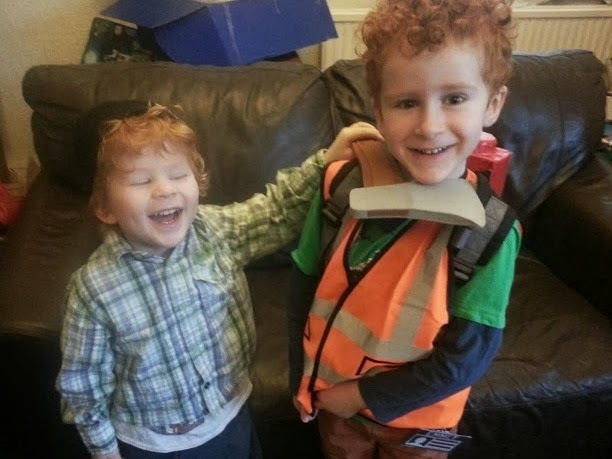 What did your children wear for World Book Day this year? It's really simple and requires only 4 items. A rectangular cardboard box that has a square profile and is tall - or a piece of card that can be folded in that way. A sweetie jar or coffee lid or similar 2-3cm tall round container or lid. Take your box, (or create your rectangle of card. 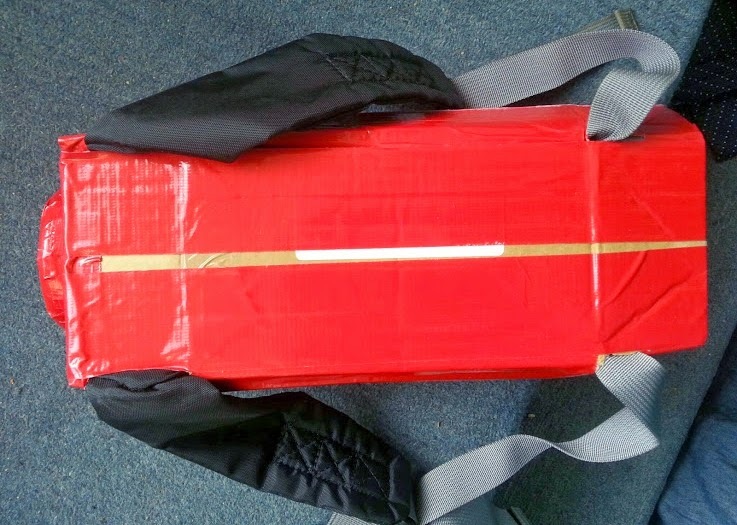 Unfasten the shoulder straps on the bag, then make 4 slits in the card and post the straps through. Refasten the straps. 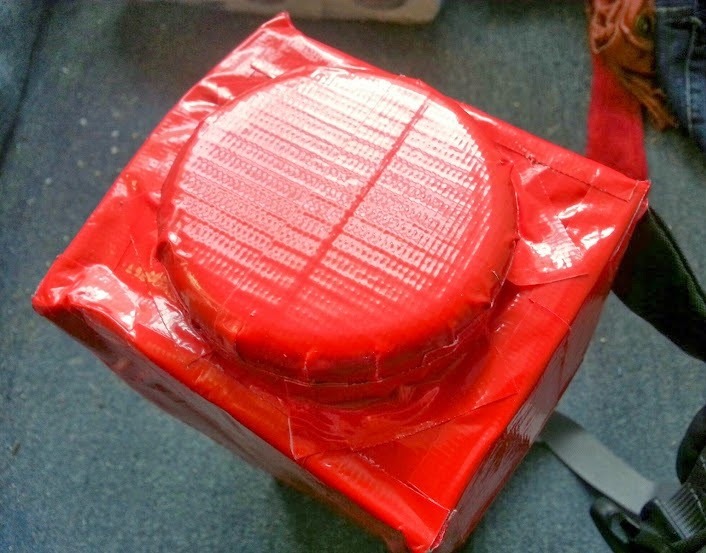 Put the coffee lid/sweet container or whatever else you use on the top of the box and then gaffer tape/Duck Tape the lot. what a cute little woodcutter! Awesome, this year Monkey's school just went for the 'come in you pjs and lets have a reading day', so off he went in his Spiderman Onesie! 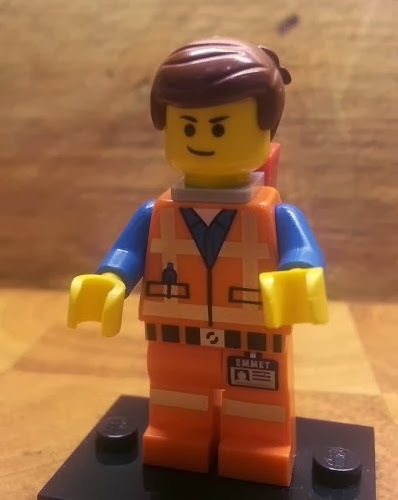 Love the Emmet costume and I completely agree he is in a book! Fab ideas for both boys. We didn't do dressing up at school for World Book Day. I like his logic! Definitely a clever boy. They both look fab. My son had a Where the Wild things are theme so I went out and bought him a 'wild' onesie. I was going to alter it a bit but this week has run away with me a bit! I needn't have worried though as there were children there in all sorts in no way related to the them - a Spiderman onesie?! Those are great costumes. I must admit to a tinge of disappointment that Bud's nursery didn't dress up, they just took their favourite book in. Both of your boys look great. They both look fab. 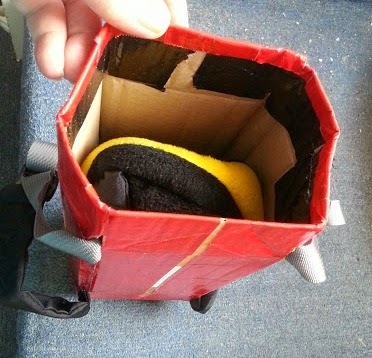 Love how your oh use duck tape to make a bag! What a great costume, we haven't seen he film yet, but my son has decided already he is going as Emit next year! It's so easy! I know it was a bit cheaty getting the jacket printed up, but it's a real reflective jacket and for £3 I don't think anyone can complain! Well done to your son for knowing that his character was actually from a book. Mine is in High school, so no dressing up any more!! I'm not sure what's going on here but World Book Day just passes us by! It might be that it clashes with St David's Day every year?? I must admit it does seem a bit intense, but given books play such an integral part of all our of lives it is definitely a day to celebrate.